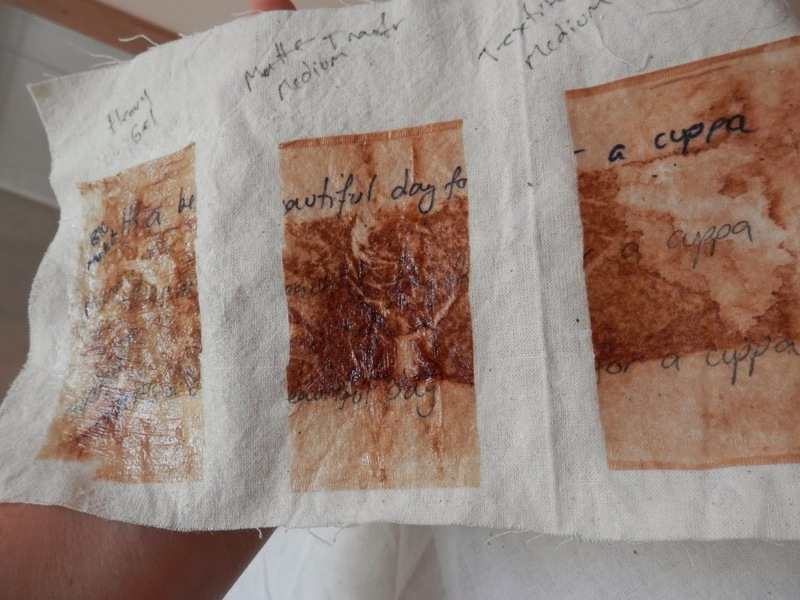 An experiment in combining teabags and fabric. Yeah, that's a weird title. 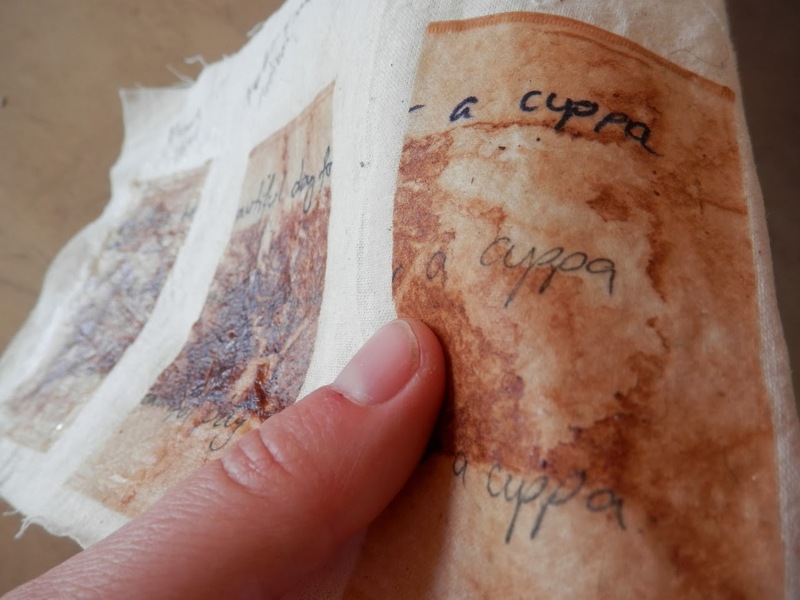 Teabags and fabric - not as in dyeing using tea, but adhering teabags to fabric. 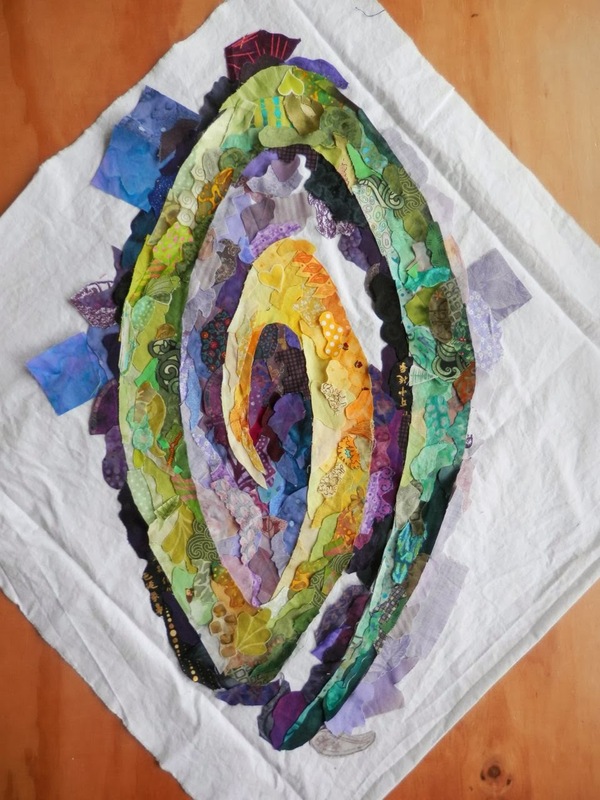 I've seen people (namely Judy Coates Perez) use teabags -and I'm also guessing you could do this with tissue paper - in her quilts. 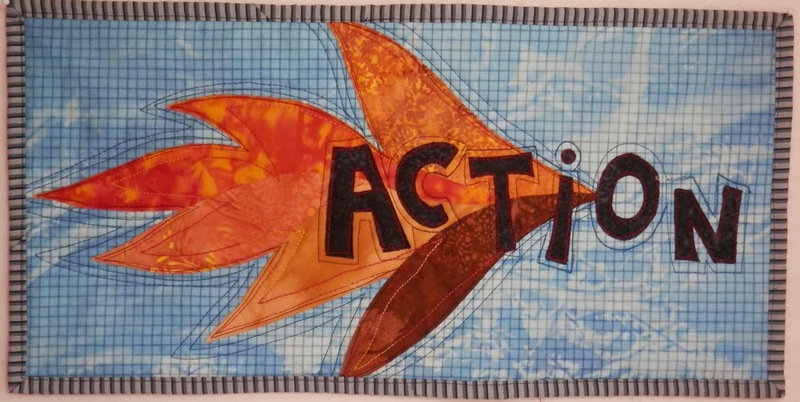 She draws on them and then sticks them to her quilts using painting mediums and then quilts right over the top. So I thought I'd do a little experimenting. 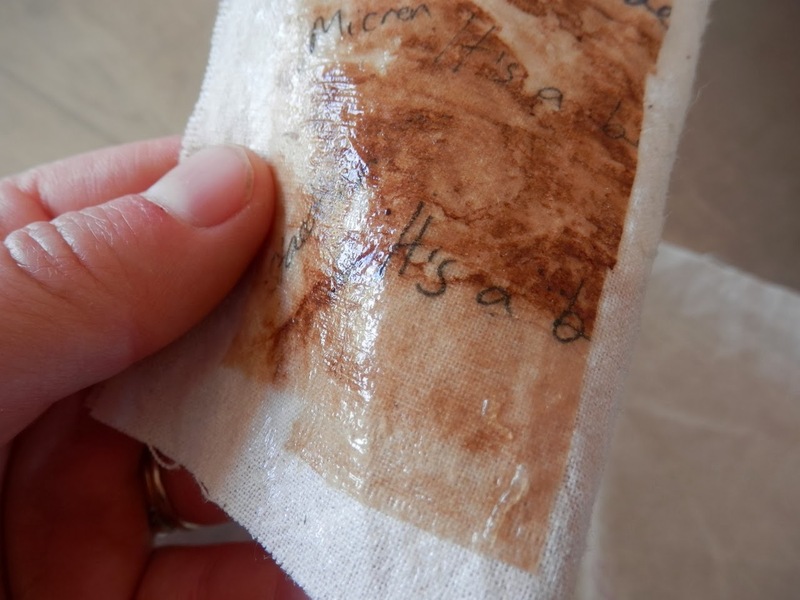 I pulled out a dried, emptied and pressed teabag that I had stashed (the things I have stashed would boggle my Husband's mind) and wrote on it with three different markers. I cut it into three and then used three different mediums I had to adhere the pieces to some calico fabric. 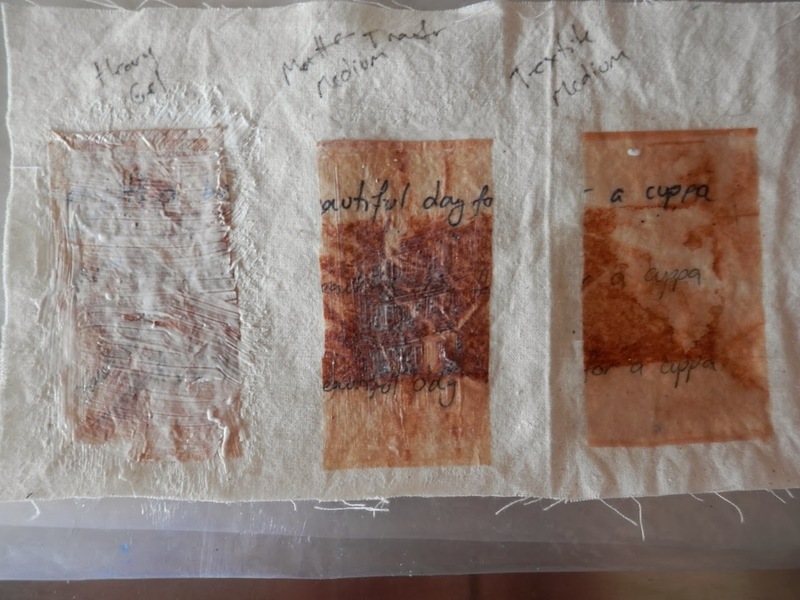 I put a thin layer of the medium on the fabric first, then the teabag and then another layer of medium over the top. I let it dry and then assessed the results. This is heavy gel medium. I was really thick to apply and has dried shiny and thick and firm. This is a transfer medium. I was going to use a matte gel medium that I had but when I opened it up I found it had gone off - stinky! Moral of the story - use up your products people! 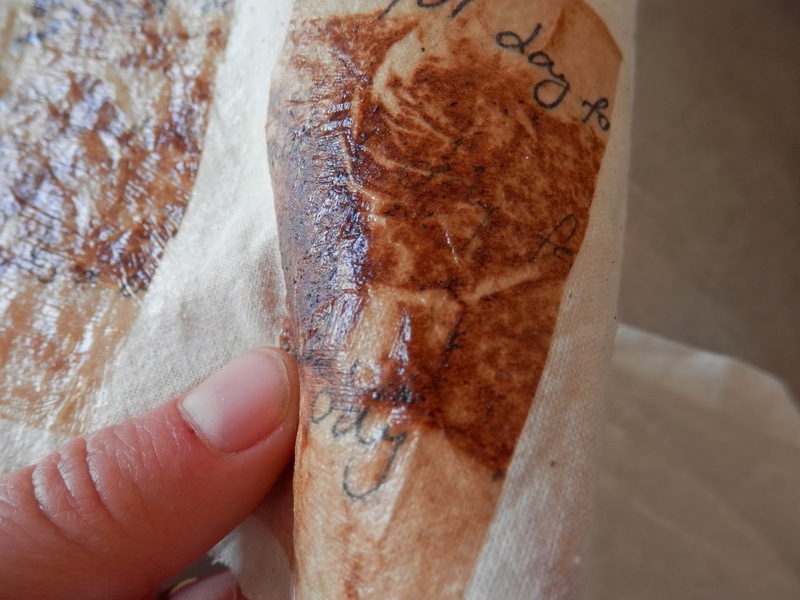 So this transfer medium (used for transferring images to fabric) got used instead. It dried firm and a little shiny. This is fabric medium - what you add to acrylic paint to turn it into fabric paint. It dried matte and thin. All three adhered the teabag extremely well to the fabric. You might be able to get it off but it would take a fair amount of scraping. I'm going to use the fabric medium and a combination of the markers for the work I'm planning. I'm glad I experimented first because I would have just used the gel mediums but I really didn't want such a shiny surface. I'll put my sample in a folder for future reference and go drink a few more cups of tea! Apparently when you record a podcast, you should also include a blog post about that podcast. That post is called show notes (now doesn't that sound all professional?!) and it gives you a basic rundown of what was talked about and, in particular, further information and links to websites that were mentioned. 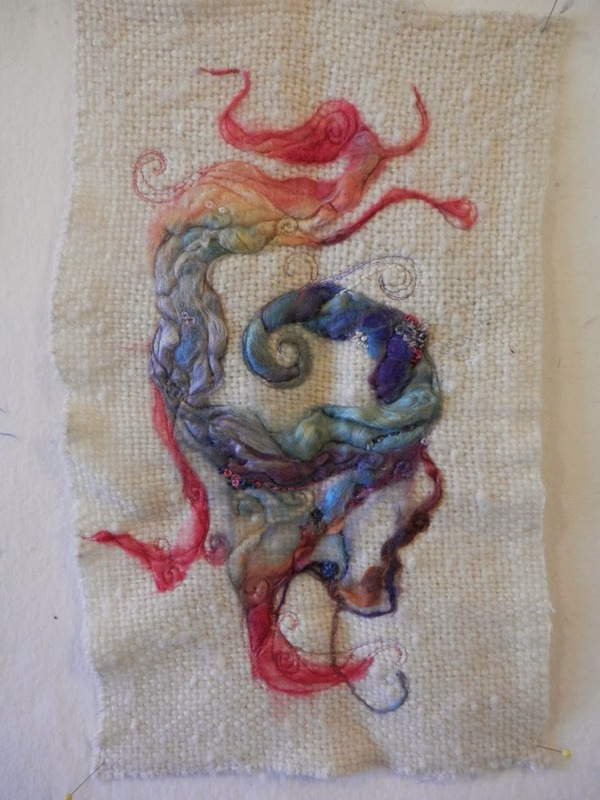 This podcast I talk about my acceptance to the Living Colour travelling textile exhibition. 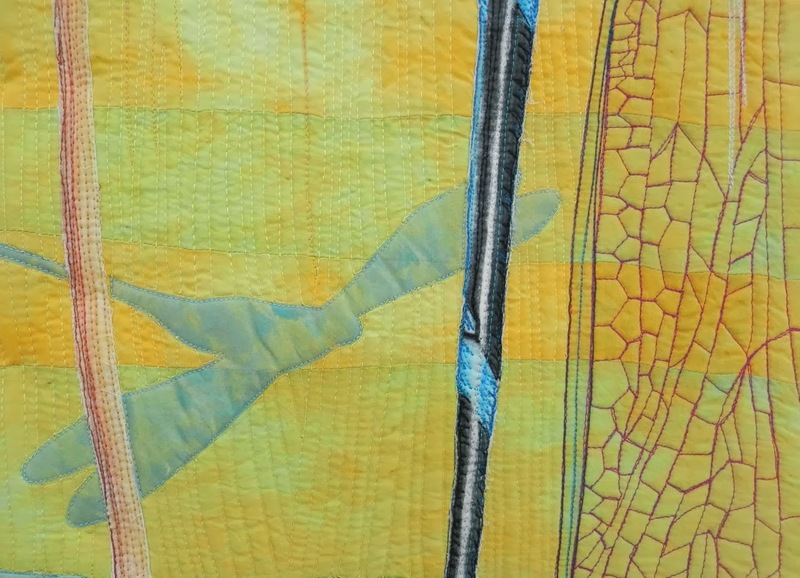 Here's a little glimpse of my quilt 'Summer Dragonfly' made for the Living Colour! exhibition. I also talk about guide words. A link to Jeanette DeNicolis Meyer http://www.jdmeyer.com, with whom I'm taking a workshop soon. 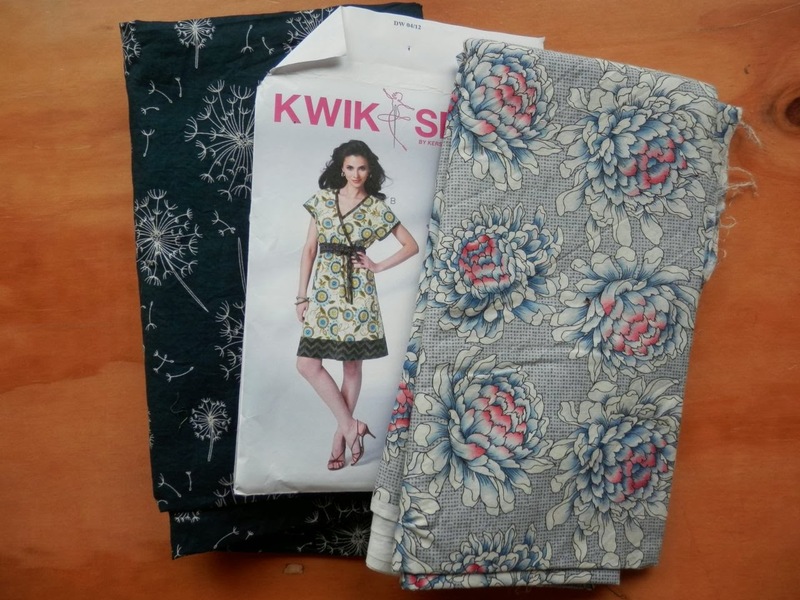 I also talk about my Beginner Quiltmaking classes and how inspiration can strike. I'd love to hear how inspiration strikes you! 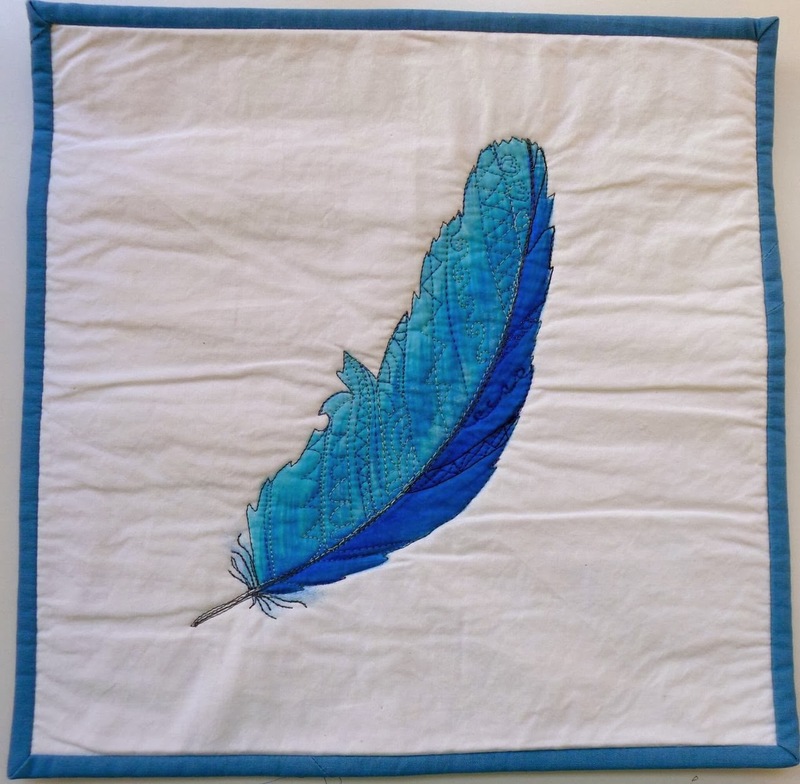 Sue from ratherbequilting, asked to see finished photos of some of the bird and feather quilts I posted about way back here. 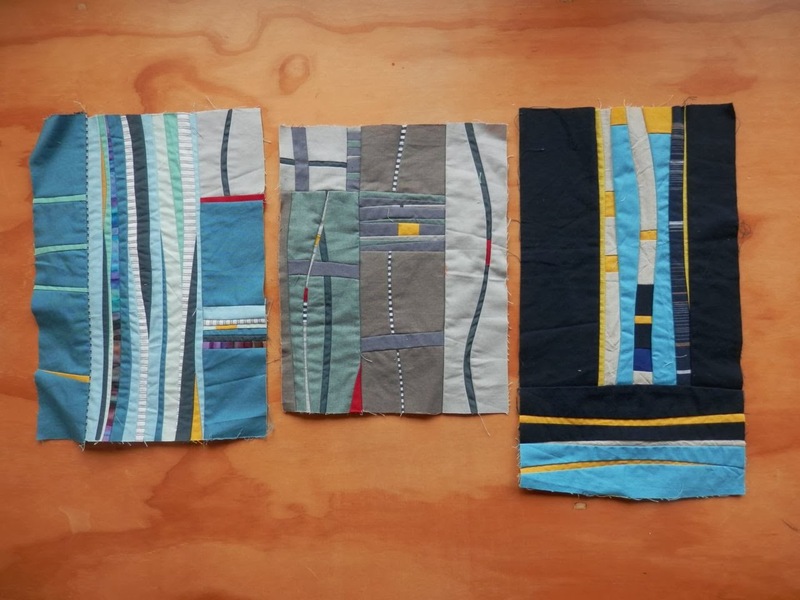 She's in luck because today I got photographs of my two BLUE challenge quilts emailed to me from the lovely Anne at Aotearoa Quilters. Something happened to my pictures of the finished quiltlets and I emailed Anne, who received all the quilts for exhibition. She obliged my humble request and sent me through pictures of both of them. This one was titled (imaginatively) 'Blue Feather'. It's looking a little squashed from it's journey and in hindsight, I think some quilting on the white background would have helped, but at the time I was loathe to disturb the simplicity. You live and learn I suppose! And this one was titled (I think! 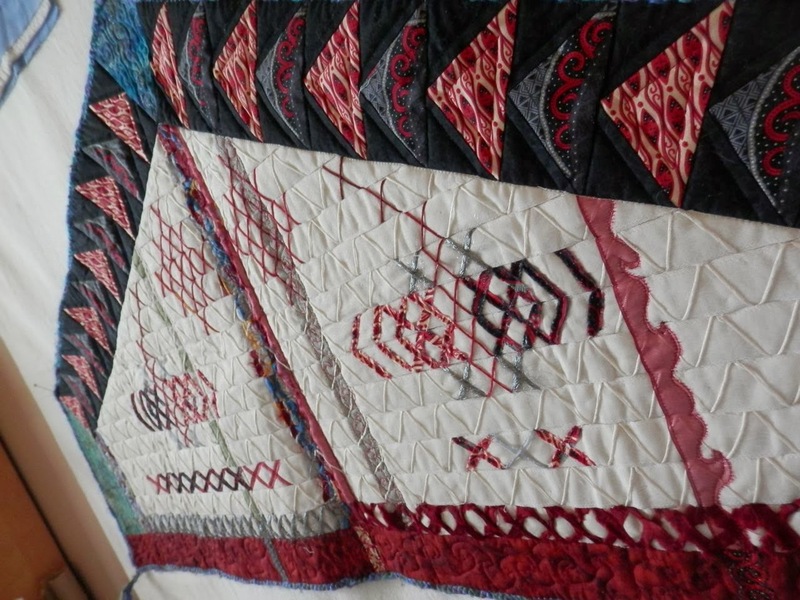 Yikes, bad quilt documenting, slapping my own wrists!) 'Spring Flight'. It is actually pretty square, it's just a slight angle on the photo. 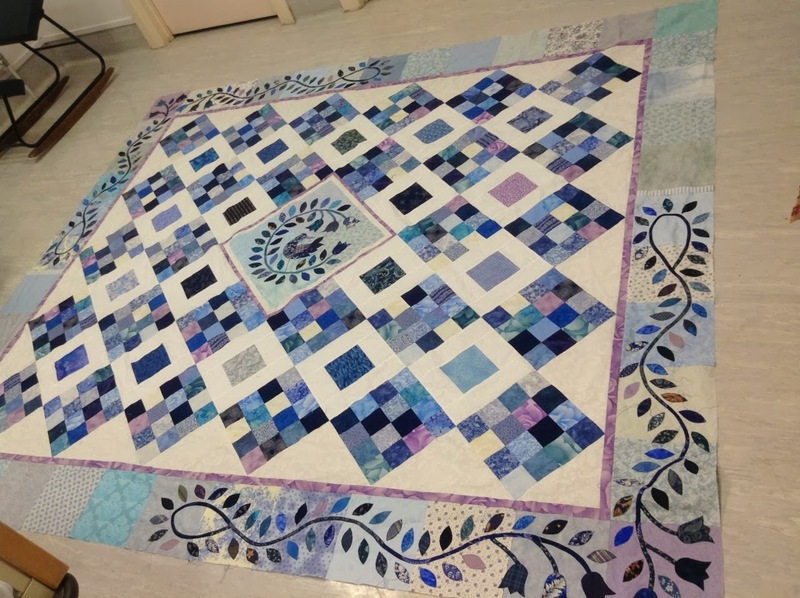 The BLUE challenge received 95 quilts from all over the country and is currently on show at the Christchurch Quilt and Craft Fair (last day tomorrow) and then in a week or so will be at the Palmerston North Quilt and Craft Fair. All quilts are for sale for $125. 1st - Mary Transom "Blue Girl"
Gloria Scanlen "The Guiding Light"
Congratulations to the winners and thank you to all who entered. Special thanks to Cecile at Unique Stitching for sponsoring the Challenge." Here's a link to the Unique Stitching website, they have some pretty awesome stuff to play with! PS - thanks for all your kind comments on my podcast! I think I sound funny - but your own voice is always weird to yourself, right?! I've been listening to podcasts for a while now and really enjoying them. 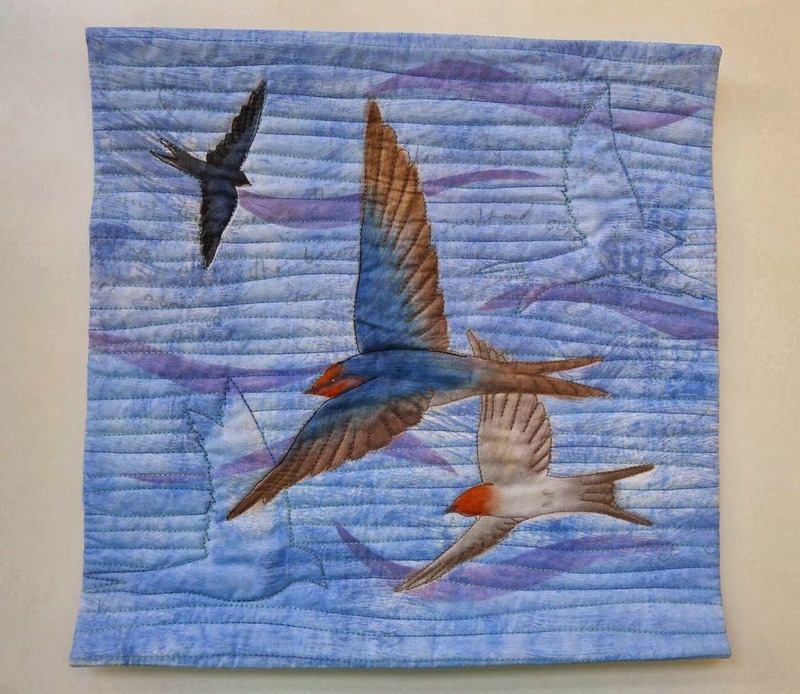 Then a while back I came across some quilting podcasts. They make my day more enjoyable as they keep me company when I'm doing housework or cooking or working in my studio. So I took the plunge and thought I'd start one up too. Why not? 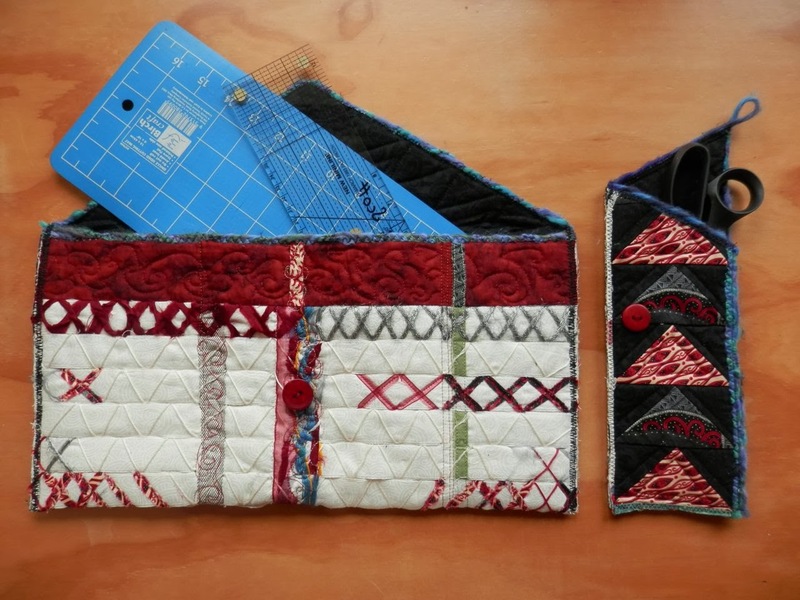 There doesn't seem to be any NZ or Australian quilting podcasters - I thought I'd get the ball rolling. 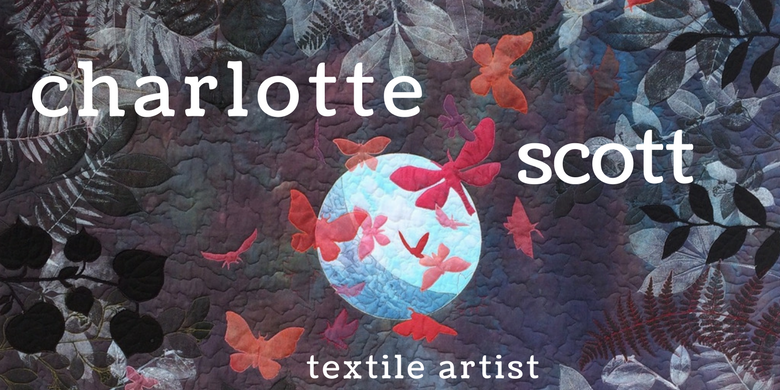 Eventually I'd like to include interviews from NZ quilters, rundowns on exhibitions and shows, and magazine and book reviews. But for now, I'm figuring out how it all works so most content will be about what quilty things I'm up to. 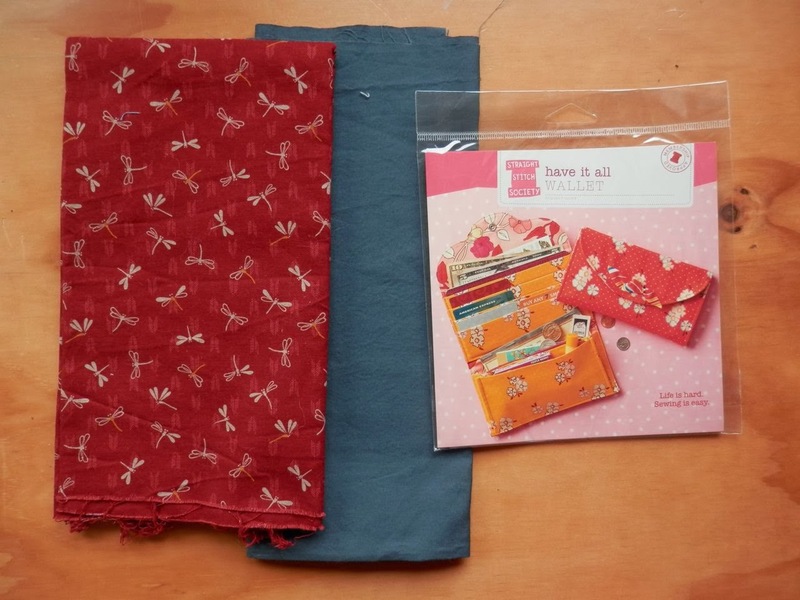 American Patchwork and Quilting Radio. Quilting...for the rest of us. Just type in quilt or quilting in iTunes podcast search box and you'll come up with several more. 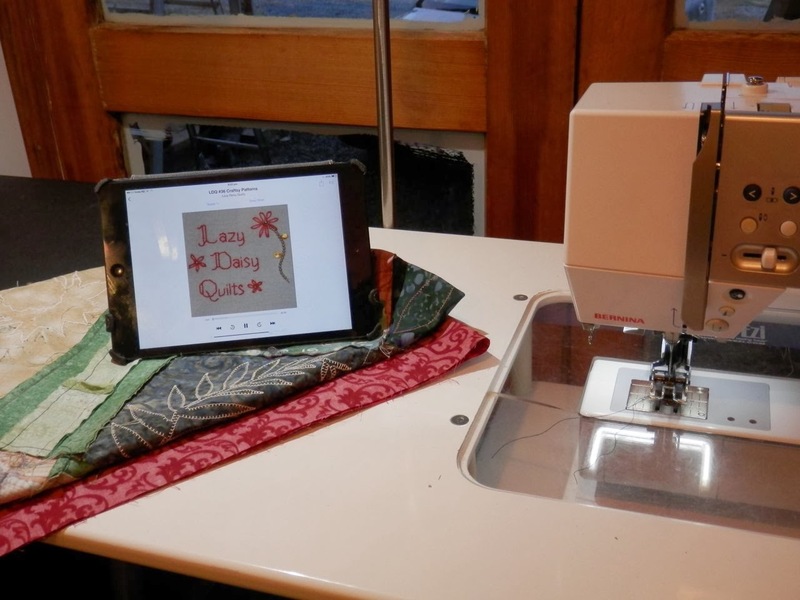 Or visit Nonnie's Quilting Dreams - she has a podcast too and the link takes you to a blog post where she lists all the active quilting podcasts she knows about. Here's Lazy Daisy Quilts keeping me company on my in the studio. What about other interesting podcasts? 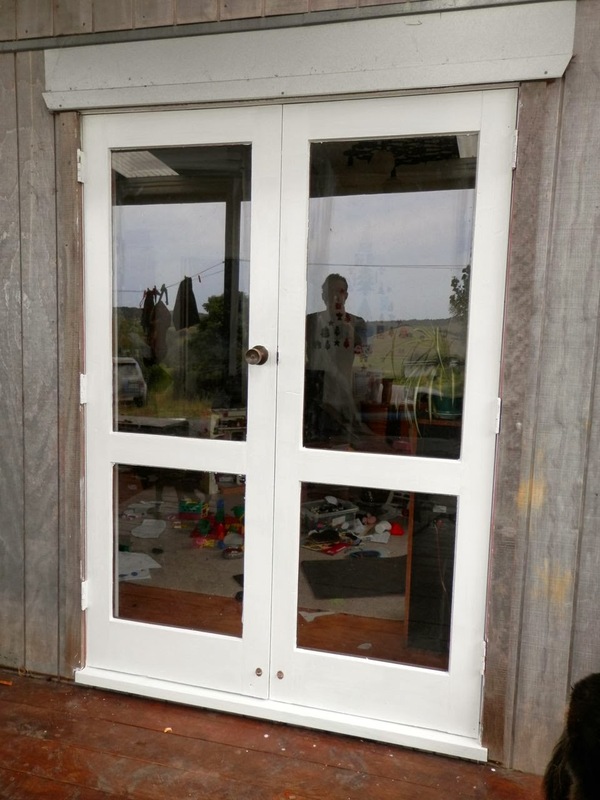 Country Life - Radio New Zealand National. 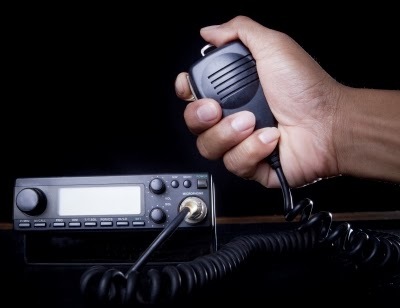 This Way Up - Radio New Zealand National. And the BBC have HEAPS of great podcasts. These are all available on iTunes too, you just have to type in a relevant search term. You can subscribe to podcasts and when there is a new one released, it will pop up in whatever app or program you are using. So what's my podcast? The Slightly Mad Quilt Lady of course ;) I've only released one episode so far. I didn't tell anyone about it as I wanted a couple of my friends to listen to it first and tell me whether it was listenable (is that a word?) or terrible! Apparently it's not too bad and so I am going to continue. I'm going to aim for a podcast once every one or two weeks - but I make no promises 'cause I know life has a habit of getting in the way. Here's my link via Podbean and here's my link in iTunes. The iTunes is only just registered so it may be a little hard to find for a couple of days via searching. Please leave me a comment either here or on the Podbean website to give me some feedback. And is there anything in particular you'd like to hear about? Are you sick of UFO's yet? I had this silk organza piece hanging around in my UFO pile. I liked it but I wasn't sure how to continue (imagine it without the flax stalks and the Tui). The reason was, I had pinned all the organza strips down and started to sew them down, but it was a royal PITA with all those loose edges! So my solution was to fuse two fabric flax stalks over it and slide a few more bits of fusible web under the loose side edges. That got rid of the pins and made it much easier to handle. Then I took a bit of silk organza and ironed a freezer paper mask to it. You can see that above, on the bench. 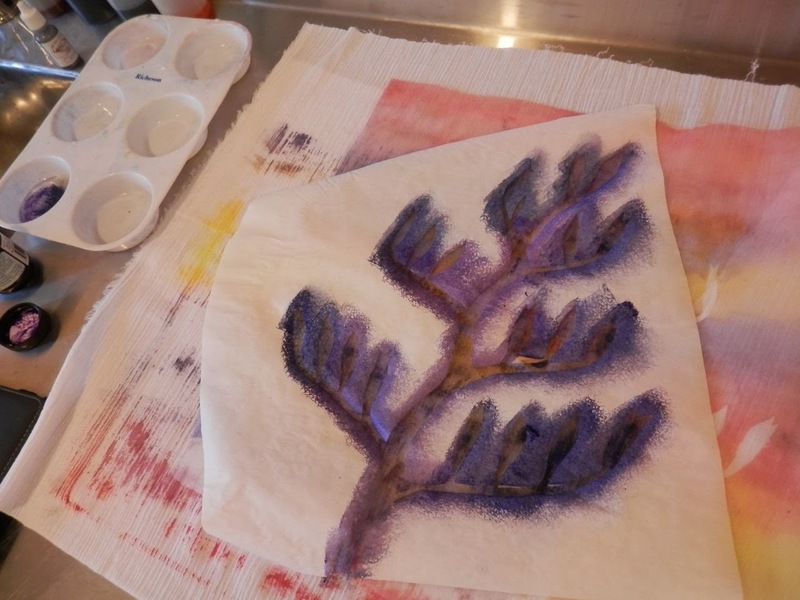 I then painted the silk organza with watered down fabric paints and heat set it once it was dry. 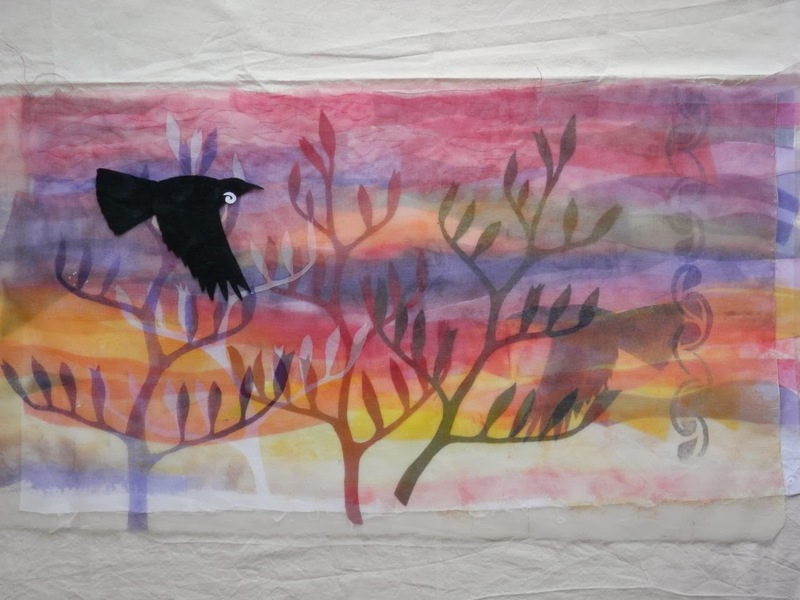 I was vaguely trying to follow the colours of the background, but if you look closely you can see that I flipped it eventually - one of the clever things about using organza. 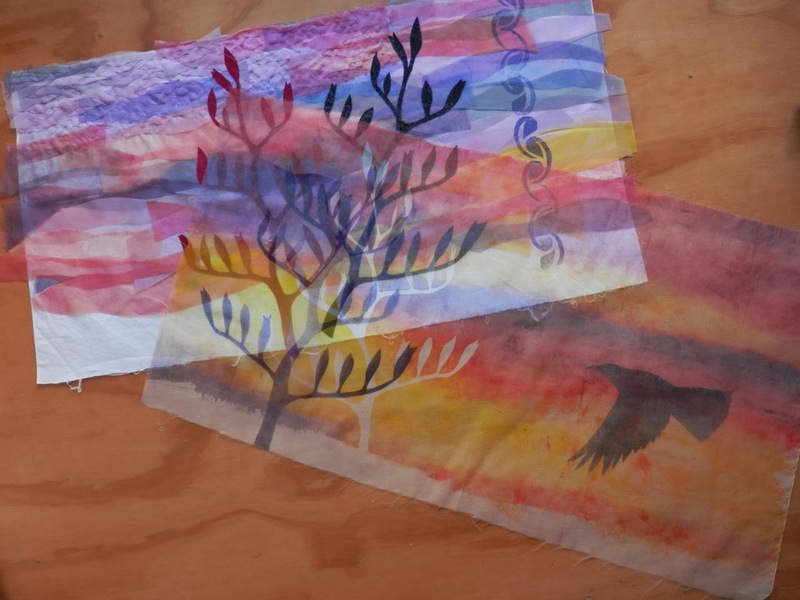 This time the freezer paper is used as a stencil - see I get to use both the positive and negative cuts of the freezer paper - frugal, no?! I stamped on the background using fabric paint and one of my own hand carved stamps. This is how they looks once they are layered. Still needs a bit of cropping. I moved the appliqué Tui to the foreground as I decided I didn't like it behind the organza. 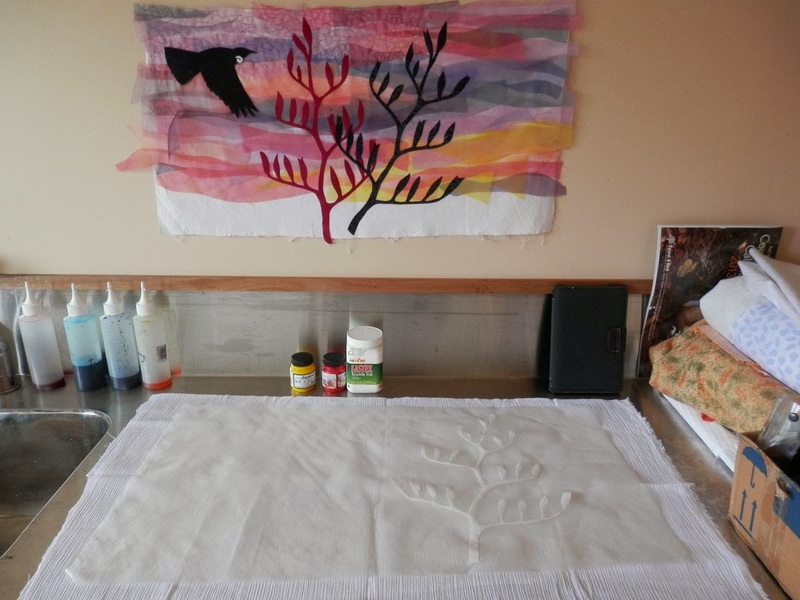 When I quilt it, I plan to quilt the outline of another flax stalk and another Tui as I like odd numbers of things. So big progress on that UFO! I'm thinking I can now change it back to being a WIP...? I've chucked another couple of oddities in the bin (like my unspeakable attempt at trapunto, ugh) and I've another few things on my radar - including the Oscar* quilt. *Oscar is what I'm calling Suz's UFO that she tried to chuck away and I rescued it from the rubbish bin - I'll show it soon, promise!! And here is one for the finished pile. A friend's elderly grandmother can no longer see well enough to stitch and all this project needed was a binding. I sewed it on for her along with some hanging corners and now she can enjoy it on her wall. 'Summer Dragonfly' accepted to Living Colour! Apparently there were 177 entries so I'm feeling a little bit humbled. Today is Waitangi Day in New Zealand. It's a public holiday and as we live pretty close to Waitangi itself, we usually go along. But not today, it's rainy and windy and generally yucky. We also planned to paint some more window sills but that ain't happening either. So what's a girl to do? More shelf cleaning of course! I made this wallhanging for the NZ Hoffman Challenge quite a few years ago. Then I folded it up and put it in the cupboard and it's been taking up space ever since. I don't like it enough to hang it on the wall, but I can't quite bring myself to chuck it either. Well, a few slices with the rotary cutter later, a bit of zig-zag along the edge, a couple of buttons and I have a scissor or rotary cutter pouch and a pocket for my mini cutting board and a small ruler. Perfect for a sewing date at a friends. And then I found this little UFO. It's silk roving type stuff (I don't know what you call it when it's silk) free-motion stitched down onto hand woven wool and I've begun hand stitching here and there. But what on earth do I do with it? It's too fragile to become a pouch or anything useful. Any suggestions? I think the next UFO I'm going to show you is the hated one that Suz mentioned in a comment on my blog yesterday....so come back again tomorrow! Today (Wednesday) was the first day this week that I had to myself at home. The kids are back in school after the Summer holidays and I wasn't working. So I got stuck in to one of my quilting monkeys. I braced myself and began sorting through my UFO's. These were just (some of) the ones that had been piled on my sewing table and then shifted from there to become a pile on my laundry bench and were threatening to topple! This is a block from a class called Serendipity Stars by Barbara Bilyard. 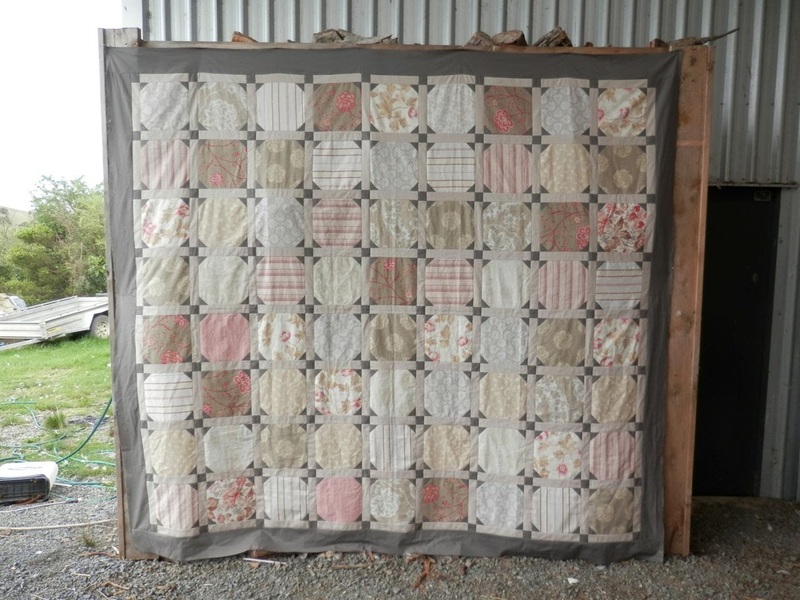 She was a very well known NZ quilter who, sadly, has passed away now. I completed one block - and hated every second of it! So I've pressed under the edges a quarter inch and am thinking of turning into a cushion. What do you think of the ombre background? Yes or no? I stuck all the fabric I had in the bag back into my stash 'cause there is no way I'm making more of those blocks to make into a quilt! Singing Tui. He's all basted (with fusible) and just needs quilting - and binding and labelling and hanging sleeve....why do those bits always take longest? Three little samples from my Gwen Marston class. Pondering what to do with these......suggestions welcome. Sample from Susan Carlson class. Love her quilts, not so much her technique. I won't get this finished and I'll never make a quilt like this so I binned it (gasp! ), but everything is glued down so can't be rescued, and you know what? It felt good! Oooo! Here's one of those garments I told you about. Although technically it's not a UFO because I haven't done anything except pick fabric. Still feel the love for this one. This is just a fabric pick too. A cute little wallet. Gonna put the fabric back in the stash and put the pattern in a separate pile of 'patterns to make'. 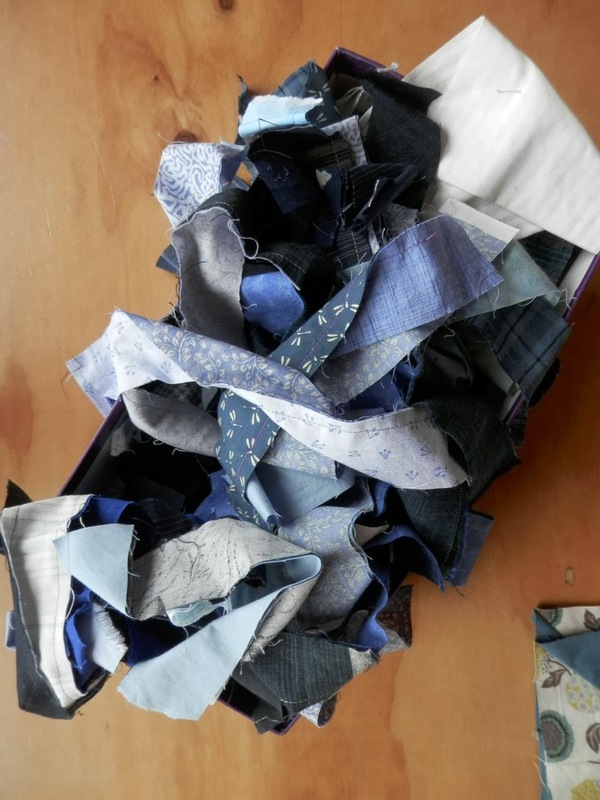 Sooooo many 1 1/2 inch strips left over from my Dad's log cabin quilt. I sat down and I've now sorted these into similar lengths. I'm going to sew about four or five similar lengths together then sub cuts them into squares and make some sort of rail fence type quilt. Sounds like a good idea for a leader and ender project. I also found an orphan paper pieced block. What to do with that? Well I used it to cover a notebook but, duh, forgot to take a photo. And to top it off, I worked on the lego storm in the lounge, vacuumed, did laundry and took a moment or too to polish my halo...! I've been spending some time thinking about what I'm aiming to do in 2014. Yes, I generally steer away from 'resolutions', but I do think that it's a good time to review, take stock, plan etc. And then I'll have a record about what I was planning for the year to look back on at the beginning of 2015 (and either pat myself on the back, or grimace and move on!). I have a wall planner that I've written down my quilt related events. 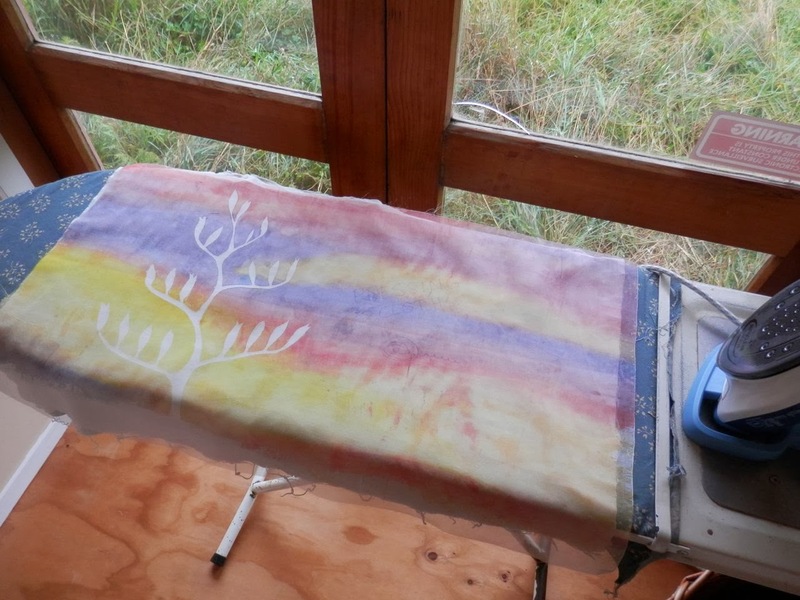 and Jacqui Karl in August, a two day class/retreat held in One Tree Point in conjunction with Tulis Textiles. My best quilting buddy in the last Jeanette class I took. I have written down the dates for my Beginner Quiltmaking Classes, wednesday evenings for six weeks, beginning in February. 31st January, Living Colour - DONE! 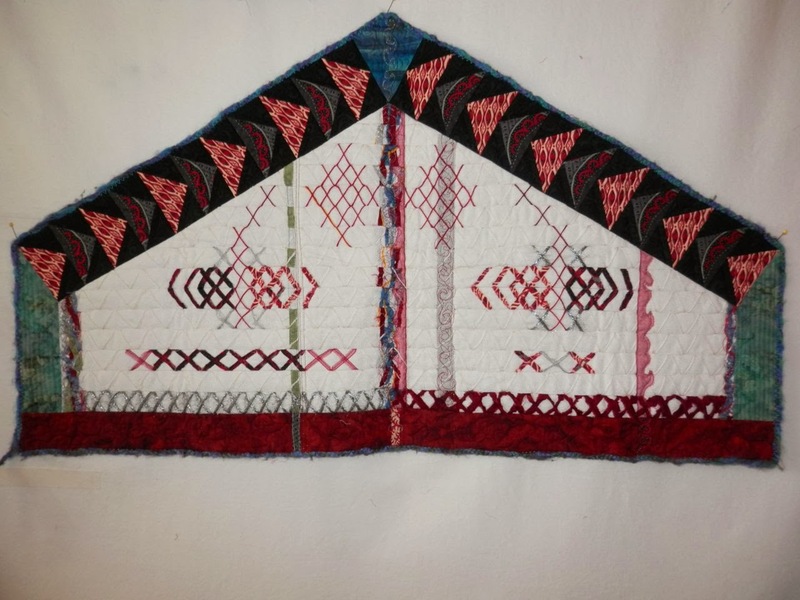 1st March, Pour l'Amour du Fil, a French competition (themed 'Drifting Away') I found out about by reading QuiltMania (the link takes you to a page in French - if you can't read French, I have the details in English if you are interested). 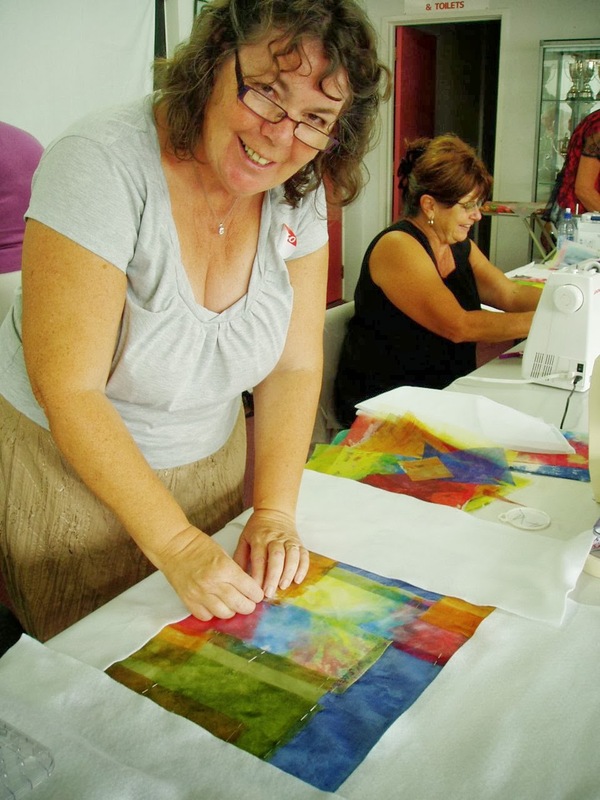 5th April, Dorothy Collard Challenge hand in day, run by the Auckland Quilting Guild. 4th October, Auckland Festival of Quilts hand in day. 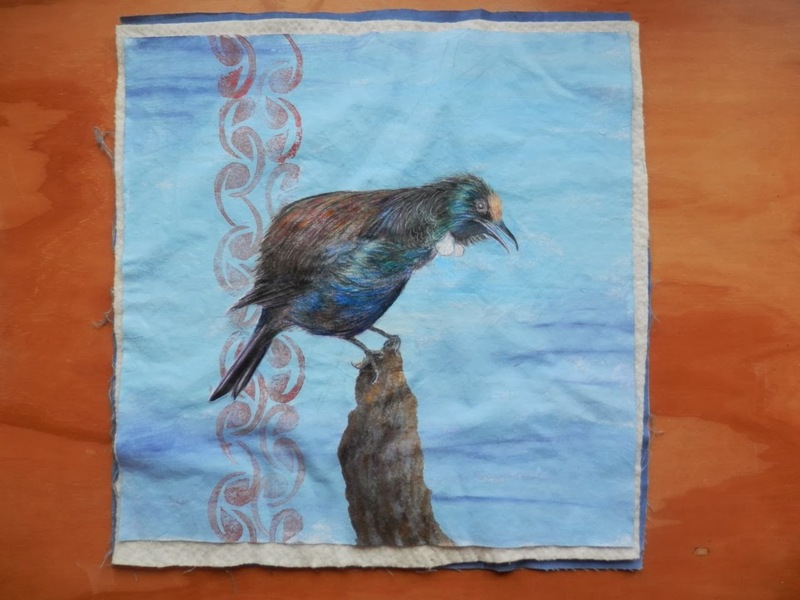 1st November, Manawatu Quilt Symposium deadline. The other thing I've done is make some Quilty Resolutions (I know I just said I steer clear, but a girl has to join in sometimes!) and listed them with Quilting...for the rest of us. 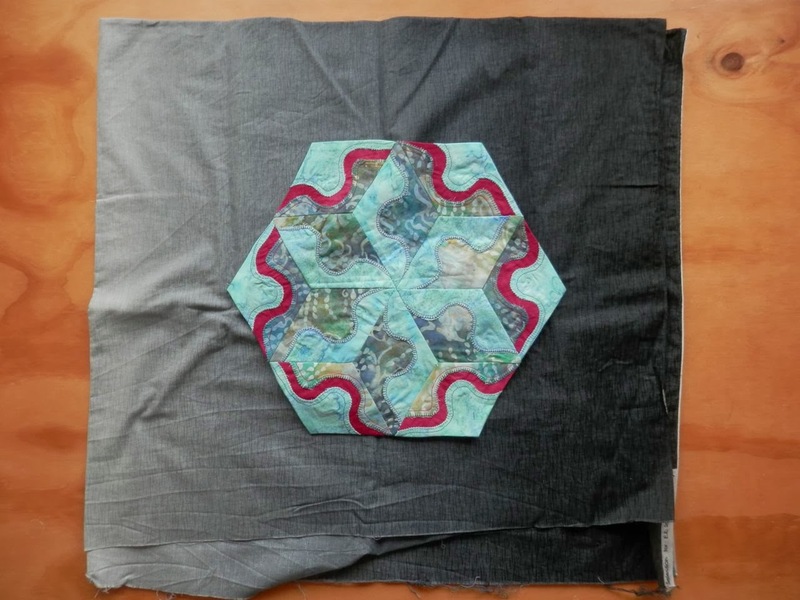 Sandy, from Quilting...for the rest of us, writes a good blog and does a great podcast. She discussed getting some quilting monkeys off our backs. You know, those things that have been hanging over our heads - or on our backs - that we just need to get done and get out of our lives. Boring, but necessary. Taking stock of UFO's (unfinished objects). Working on them, finishing them and getting rid of the ones that are just taking up space. Sewing a garment. I started sorting my UFO's last night and I found at least three garments that I've started and never finished. I need to sew a garment, even if it's just to say I can! And then I promise never to buy another dress pattern again! 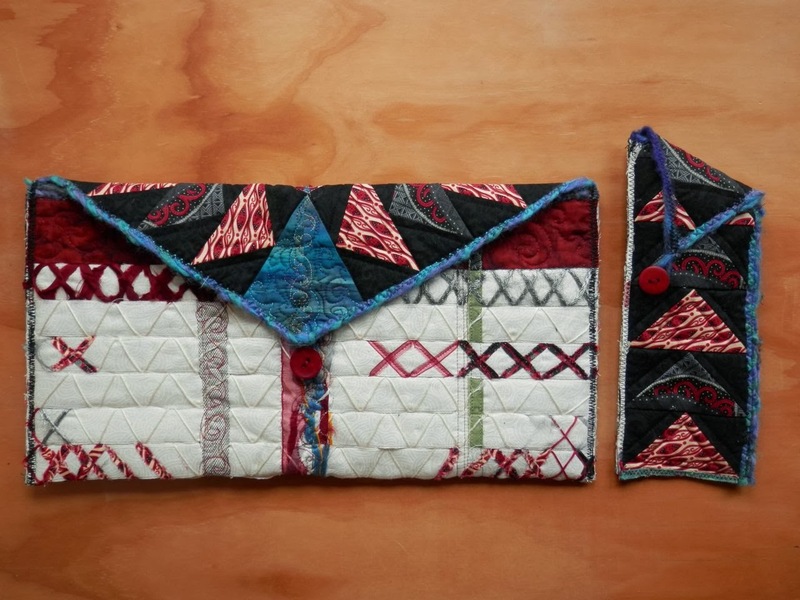 Enter a quilt, or quilts, to the Auckland Festival of Quilts. I've been meaning to do this for two years, I just need to do it and this is the year for it. Yup, Blue Room is still not finished. And Creme Brûlée needs basting and quilting. So far, so good. All pretty doable. If you read this post, some of you might be wondering whether I'll be studying art. Nope. I had a long talk to my husband about what I wanted to achieve and where art study fitted in and we decided that it's not the year for it. 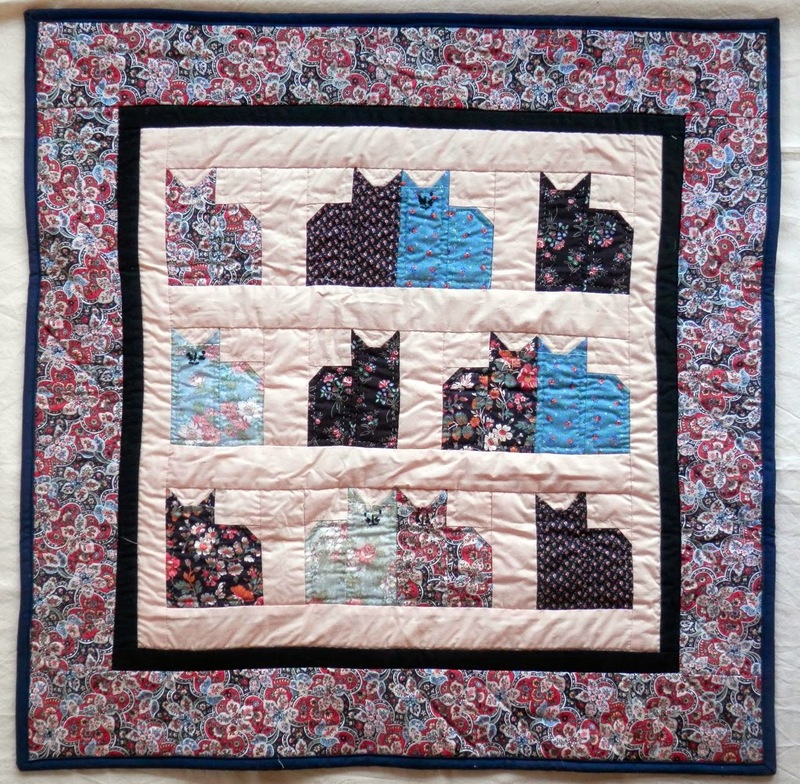 I want to eventually make quilting my profession. How exactly? I'm not sure. 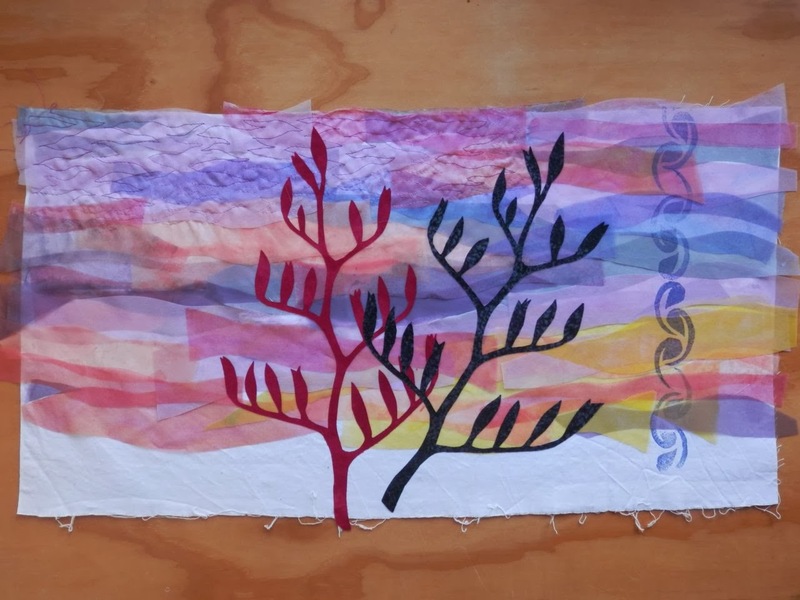 But the people I've seen who do make their living from quilting seem to combine several strands to make it work - making quilts, teaching, fabric design, article and book writing etc. So instead of spending a few years studying, I'm going to try and focus on what is already working for me - making quilts, writing patterns, and slowly getting my name out to the universe. That's another reason why I'm starting to teach beginner quilt making classes - to dip my toe into teaching. I'm being honest, this was my lounge this afternoon! As for family/house goals - well, that photo might sum it up! I have listed areas that I want to work on, and first up is the kid's stuff. 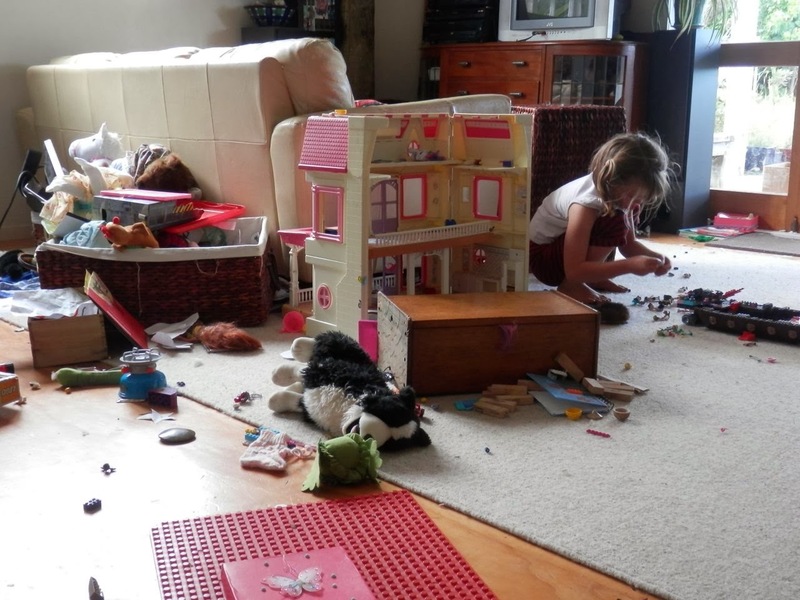 I've been really lax on cleaning, sorting and keeping chaos under control during the school holidays as it just gets undone so quick. Nuff said. We are still looking for somewhere new to live. We've decided we really need to be closer to civilisation as the travelling with kids activities is getting tedious. And hubby wants to be closer to the ocean for his fishing. We offered on this block, but were rejected, even though we upped our offer to the registered valuation that we paid to have done. So we are now preparing to offer on another block. This one is bare land, no dump of a house thankfully, but it means it would be a longer process before we are able to move. 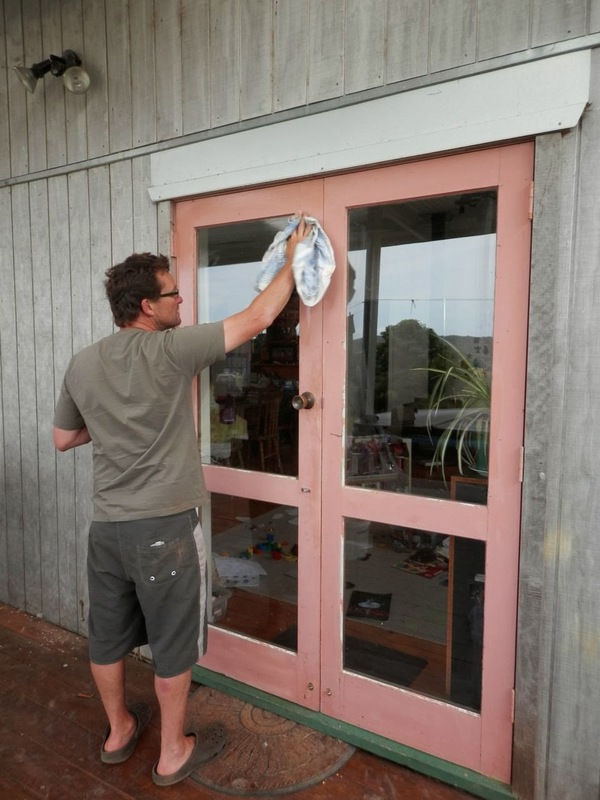 We've been spending some time doing much-needed chores around the house, just in case we will be selling or renting.